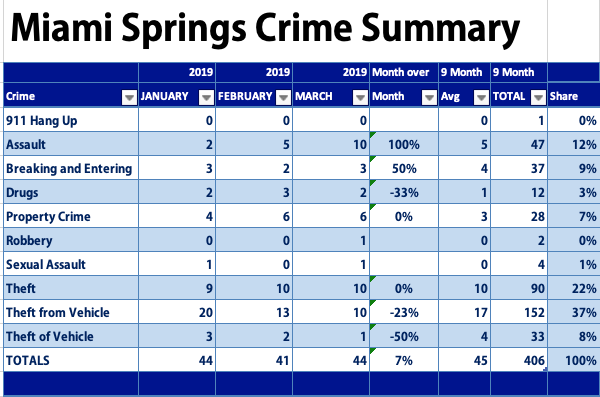 According to CrimeReports.com, the City of Miami Springs had 44 reported criminal incidents during the month of March or right around average over the last 9 months. What stood out last month were the 10 reported assault incidents or nearly double the average. 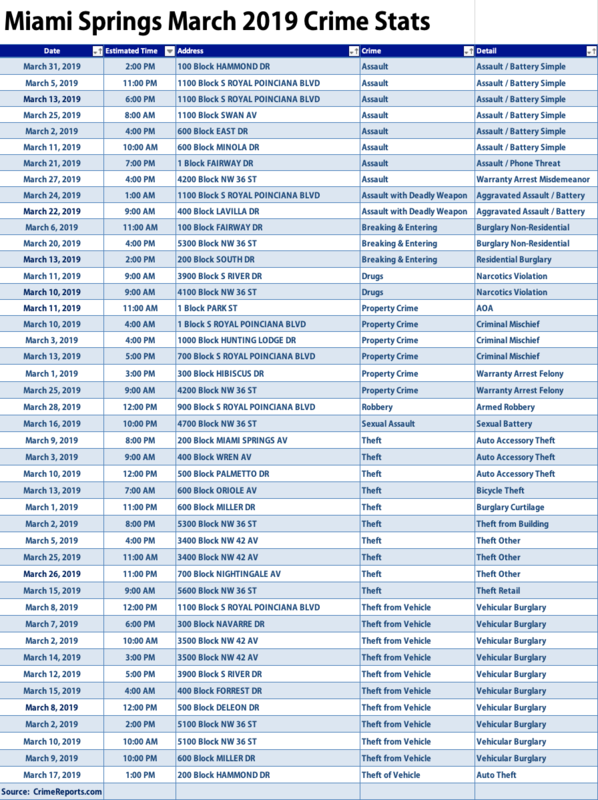 There were 10 assault cases during the month of March. Again, that’s double what we typically see during a normal month. Six cases were categorized as simple assault and battery. Two of the simple assault and battery cases occurred on separate dates at the 1100 Block of South Royal Poinciana Boulevard where the Holiday Inn is located. There were also 2 cases of assault with a deadly weapon in March. 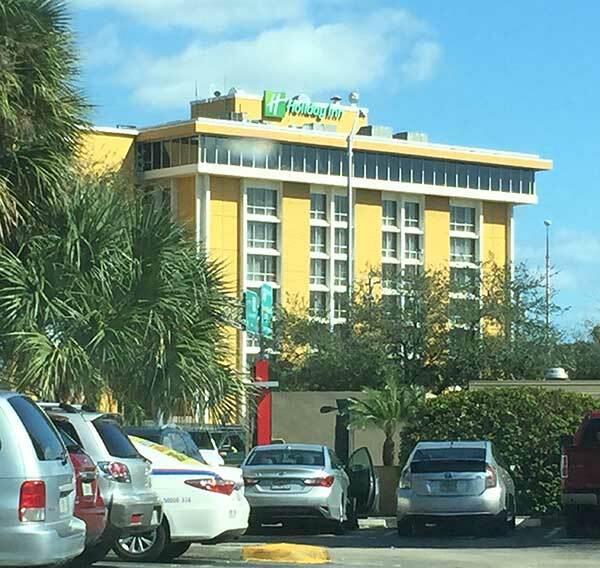 One of the assault with a deadly weapon incidents occurred at the 1100 block of South Royal Poinciana Boulevard location where the Holiday Inn is located. There were three reported incidents of breaking and entering in Miami Springs during the month of March. Only one incident was a residential burglary and it occurred at the 200 block of South Drive. The other two incidents were non-residential and occurred at the 100 block of Fairway Drive and at the 5300 block of NW 36th Street. There was one incident of an armed gunpoint robbery that occurred on March 28th at the Aladdin Hotel on South Royal Poinciana Boulevard. Click here to read more details on the incident. There was one reported incident of sexual assault that occurred during the month of March at the 4700 block of NW 36th Street. There were two reported incidents of narcotics violations during the month of March. One occurred along South River Drive and the other along the 4100 block of NW 36th Street. This is the most common crime in Miami Springs and we are happy to report that Vehicular Burglaries were at the lowest number over the last 9 months with just 10 incidents or 41% below the average of the last 9 months. Two of the incidents occurred along NW 36th street. Two incidents occurred along LeJeune Road. Only one vehicle was stolen during the month of March. That’s also a low point over the last 9 months. One vehicle was reportedly stolen along the 200 block of Hammond Drive.